Hailing from the snow-swept land of Switzerland, Bodum combine the best in affordable European design with a whole collection of tea and coffee goods to help you get your caffeine fix or abate the cold. And you won’t get it in a manner any more stylish than with the Columbia Coffee Maker. This stunning double-walled coffee maker shines in polished stainless steel, with a double wall construction to keep the contents warm and aromatic for longer. Best used with coarse ground coffee, all you need to do is add coffee, add your hot water and stir. After the coffee has brewed for four minutes, press, and enjoy a good cup of coffee! Inspired by Bodum’s original French press coffee makers, it’s probably one of the easiest and best ways to brew one’s coffee. Beautifully polished stainless steel construction. Double walled construction keeps contents warm for hours. Plunger also made from stainless steel. Use with ground coffee for best results. 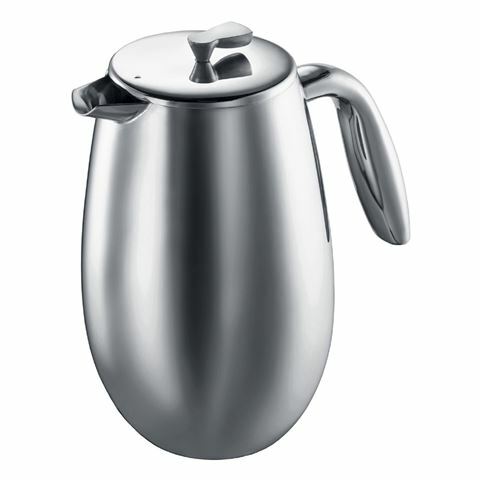 Capacity: 1 Litre (8 Cups).